Fun fact: I’ve never been able to solve a Rubik’s Cube. Ever. I like to mess them up for others to solve though. I have watched students take a randomized cube and get all the colors back together within a minute or two. There is clearly a pattern… one that I do not understand. Finally a student showed me a particular Rubik’s Cube Solver online & it changed my life. Okay, that may be an exaggeration. It is pretty cool though. On the site, you position the cube on a table in the same manner as the image on the screen. Then, simply fill in the colors on the digital cube to match what you see on the physical cube. Clicking solve will then show you step-by-step directions (with animation) to solve the Rubik’s Cube! Reading Dave Burgess Consulting, Inc books this summer has been like that Rubik’s Cube Solution website. This is my 13th year in education, and I’ve never felt like I had it all together. I may have felt successful in one area similar to the way we can get one side with matching colors on a Rubik’s Cube. After feeling accomplished for about 2.2 seconds, I turn the cube over and realize what a hot mess the rest of the cube is still in. This summer of growth has shown me ways to bring many of my thoughts together. It has allowed me to become grounded in who I am, both personally and professionally. It has helped me find my voice through blogging. It is helping me define my passions and my short- and long-term goals. It’s like I put the colors on a screen and clicked solve. Each book I’ve read has been a shift in the cube that further aligns my thoughts, passions, and goals. Book 39 is no exception. 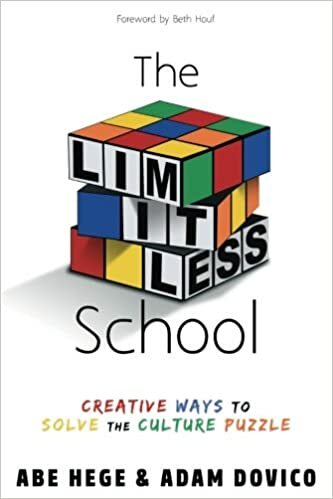 The Limitless School, written by Abe Hege and Adam Dovico, uses the metaphor of a Rubik’s Cube to highlight creative ways to solve (or continue to strengthen) your school’s culture puzzle. I have really grown to enjoy reading the forewords of these books! Beth Houf, co-author of Lead Like A Pirate, nails it in the first two pages! She says, “Culture isn’t something you do to people; it is the bedrock of any school campus…Culture first, culture next, culture always.” This is one of my favorite parts of the book written by Beth & Shelley Burgess so I was thrilled to see it here. That’s impressive, right? Abe and Adam discuss how each of these topics play a huge role in creating and strengthening a positive school culture. Trusting others, and being trustworthy yourself, are key components, both for students and staff of a school. Integrity is what you’re doing when no one else is watching. Traditions are also discussed within the book. When I started the pilot position at the STEM magnet middle school I serve, I wanted to give students a reason to come to the media center. I wanted a way to display the community effort that our school needed to be successful. Because I’ve always been a fan of puzzles (and I lucked up and found a beautiful puzzle of wild horses on Amazon for insanely cheap), I put a 1,500-piece puzzle on a table in the media center. At first, no one touched it. I put together a few pieces here and there, and a few 8th graders started venturing into the media center in the mornings to put a piece or two in. Before we knew it, the edges were complete. By then, other teachers within the school saw the puzzle at faculty meetings. They said there was no way we’d finish the puzzle with all 1,500 pieces remaining. That students would steal pieces, or pieces would drop and be sucked up by those amazing school vacuum cleaners (They pick up everything! I’d love to bring one home with me one day and see what it can do on our carpets!) I felt kind of defeated because I wanted to see the good in the students and I wanted to believe they would take pride in this puzzle that showcased their school mascot. It took nearly 4 months. The final piece went into the puzzle and the 8th graders who had worked so hard on it looked completely…lost. They had finished the puzzle, but rather than feeling a sense of accomplishment, I believe they dreaded taking it apart to put back in the box. We devised a plan and that puzzle is now a focal point in our media center – matted by a black science fair board cut to fit the space within a stunning oversized frame that I found at 60% off one day! As for the 1,500 pieces… every single piece was there. Not one went missing over the entire 4 months! That’s powerful, y’all. To be sure I advocate for this voice and better the experience of my students, I need to educate myself. I need to seek out books they can read and identify with the characters. I need to allow my students to connect with like-minded peers. Anytime I attend an edcamp and I see a session on equality, equity, culture responsiveness, etc I do all I can to attend that session. It is, without fail, the most open and honest conversations I’ve ever been part of. I need to provide my students the opportunity to engage in those open and honest conversations that I learn and grow from. I need to provide those books with characters they relate to, and those like-minded peers. Each student should have a positive role model that reminds them of themselves. I LOVE this video explaining privilege! We should all check ours! That’s where my implementation comes into play, I believe. I want to provide positive diverse role models through book selection and research in the media center. It’s a small step, but it’s a step in the right direction. I’d rather take a multiple small steps forward than one large step too quickly and risk backward movement. I’ve mentioned an open genius hour as a #DBC50Summer implementation. (Read more here in the post about The Wild Card by Wade & Hope King) Through reading Pure Genius by Don Wettrick, I learned that modeling and structuring the first genius hour is important to the success of future genius hours. I could confine the genius hour topics to be about the qualities of a positive role model & selecting a role model with which the student can identify. These positive role models, selected by students, can then be shared via whatever platform/tool the student desires and discussed among those in attendance. Remember, it’s open to any and all, so there may be 50 or 2; I’m honestly not sure. I’m taking a risk here & building the plane as we fly it. Finally, students can determine if we have any books by or about that person, and if we need purchase some. We will find creative ways to fund these new books & offer a display of diverse positive role models when the books arrive, and make them available for circulation. I knew this book wouldn’t steer me in the wrong direction! Abe and Adam are located only about an hour from me and I’d love to visit their schools! Watching their tweets is so inspiring and I love the energy in their schools that is evident through social media. (Side note: Abe started his journey as principal of an elementary school this year, so it’s been awesome watching him develop the culture in a new school using the same strategies outlined in his book!) You can follow along too by following Abe and Adam at @abehege and @adamdovico, respectively. Also see what others are doing with their limitless schools using the hashtag #LimitlessSchool. Adam’s website is here. Teach Me Teacher podcast interviewed Adam about The Limitless School. You can see that here in part 1 and part 2. If you want to change the culture of your school, and want practical ways to make it happen and quantitative data to prove it’s working, you need to grab a copy of The Limitless School! As always, feel free to add to (or start) the discussion on flipgrid! This global collaboration space for all DBC, Inc books was the brain-child of Andrea Paulakovich, who fell in love with the idea of #DBC50Summer early in the process and ran with it! I’m so thankful to be connected to her, and you should get connected, too!